We are excited to announce concert dates coming up in October that are an absolute standout to blues/rock fans in Australia. A salute to the legendary musician, Gary Moore. Presented by Storm Front Touring Australia’s best artists merge to remember the one and only Gary Moore that influenced millions over 30 years. With Mal Eastick on stage will be performing a list that is second to none in talent from Australia best guitarists being Kevin Borich, Phil Emmanuel, Dave Leslie, Peter Northcote, Steve Edmonds, Chris Kamzelas, Michael Katselos and Randall Waller. 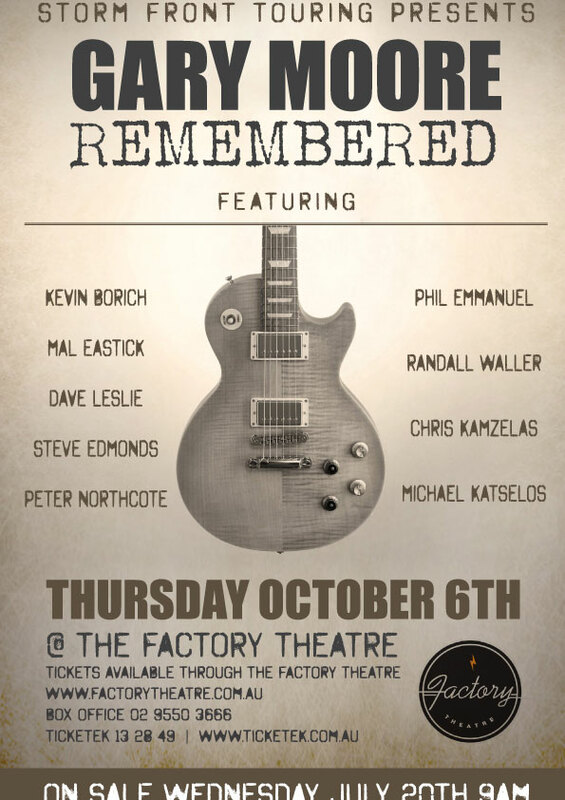 This concert event of the year is set for Thursday October 6th at The Factory, Marrickville and will be showcasing some of the songs that defined Gary Moore’s brilliant career including Still Got The Blues, Over The Hills And Far Away, Parisienne Walkways, Walking By Myself, Oh Pretty Woman and Empty Rooms to name just a few. Head to the Tour page for more details. 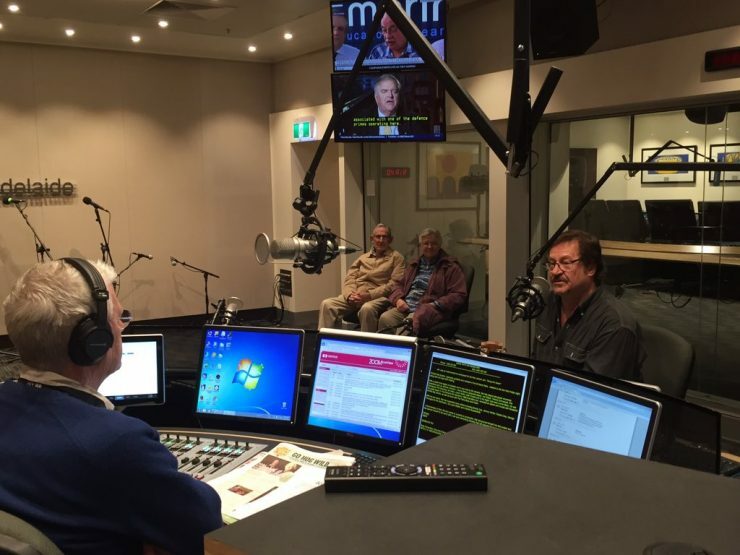 Here’s Mal being interviewed by Ian Henschke on Drive on ABC 891 Adelaide on the 23rd of June 2016. He’s the little known Adelaide guitarist who’s played with the world’s biggest music stars. Now, Mal Eastick is playing The Gov for the first time in 35 years, joined by vocalist Mick Pealing. 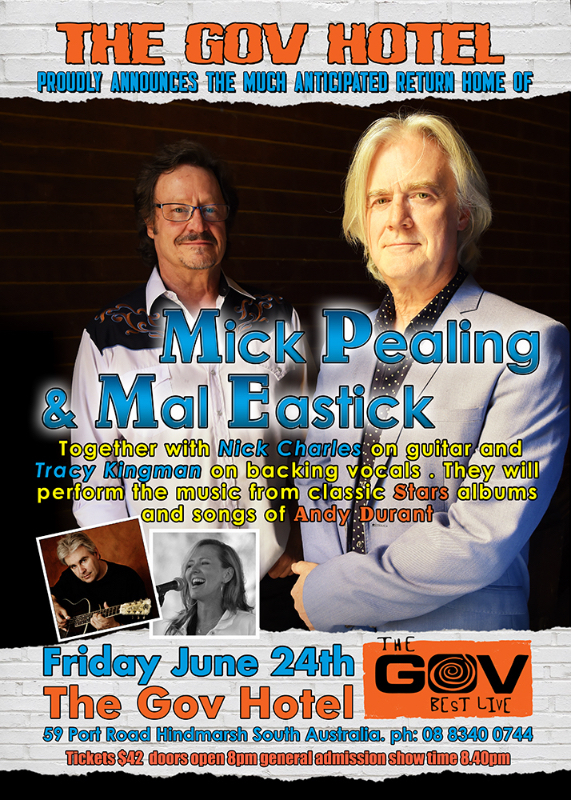 Mick Pealing and Mal Eastick of the iconic South Australian Country Rock band Stars are back touring and headed to The Gov this June. Originally from South Australia, Mick and Mal are looking forward to returning home to play at The Gov in Hindmarsh SA together for the first time in 35 years. 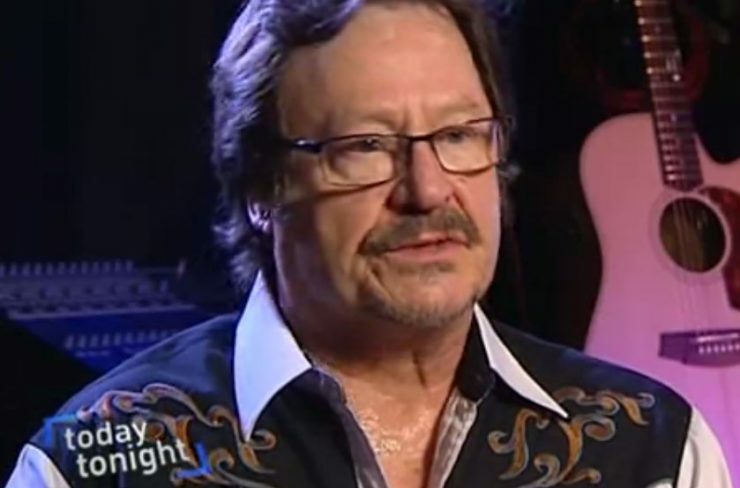 Stars were inducted into the South Australian Musical Hall of Fame in 2015 for their contribution to the Australian music scene. Mick & Mal performed on the night and due to overwhelming demand they are returning home with a fabulous show featuring again the amazing talents of both Nick Charles and Tracy Kingman. You will hear all their classic hits such as The Mighty Rock, Look After Yourself, Last of the Riverboats and Quick on the Draw. This fabulous band brings to life the music from the magnificent Andrew Durant Memorial Concert and Stars albums such as ‘Paradise’, ‘Land of Fortune’ and ‘1157’. This show has recently sold out in Melbourne so you’d better be “Quick on the Draw” and get your tickets early! Head to the Tour page for all the details. Narrowed from a record 255 acts from 40 states and 16 countries spanning four continents, the 8 solo/ duo and 9 band finalists vied for the top prizes. The Band competition 1st place went to Mr. Sipp from the Vicksburg Blues Society in Mississippi USA. Mr Sipp also won the Gibson Guitarist award. For the Solo / Duo competition 1st place went to Tim Williams from the Calgary Blues Music Association Alberta Canada. It has been an amazing experience for Mal, Milena, Stan & Tony which will stay with them for a lifetime. Mal Eastick, Milena Barrett, Stan Mobbs & Tony Boyd would like to thank each & everyone of you that have sent messages of support & congratulations, together with our sincere thanks and appreciation to the Sydney Blues Society. NEWS UPDATE Jan 26: Whilst Mal Eastick – Milena Barrett Blues Project were happy & proud of their performance tonight in Memphis, unfortunately they did not make it through to the final round. The band was set first in the performance order for their Semi-final, with the final act DieDra & Ruff Pro Band from Magic City Blues Society who were judged the winners. NEWS UPDATE Jan 25: Exciting news.. the band are into the IBC SemiFinals to be staged early Friday evening. Thanks to everyone for you all your messages and support. 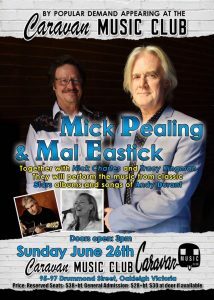 All the best from us here in OZ – check out Mal Eastick & Milena Barrett Blues Project facebook page. 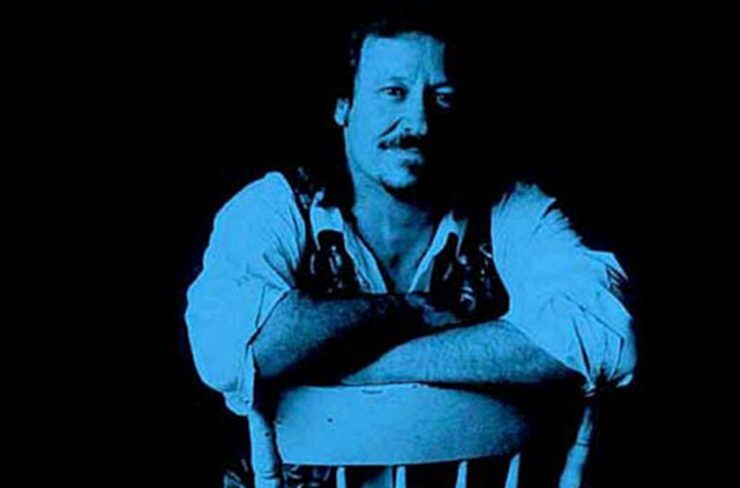 Australian blues guitar legend Mal Eastick – Milena Barrett Blues Project recently won the Sydney Blues Society Memphis Blues Band Challenge with his new band, featuring Milena Barrett on vocals, Tony Boyd (drums) and Stan Mobbs (bass). This competition won them a place at the 30th International Blues Challenge to be held in Memphis Tennessee USA, commencing Tuesday January 21st. The band leaves for Memphis on January 17 to compete in the IBC 2014 Band Competition. On behalf of Mal, Milena, Tony & Stan, I would like to express our sincere appreciation and gratitude to our friends, families, and volunteers one and all, who helped make both the Bald Faced Stag and Sunset Cruise fundraisers such overwhelming success. These were truly amazing events and the audience had nothing but praise for the magnitude of entertainment, quality of raffles and merchandise not to mention the simplicity in which the events program flowed. Congratulations to everyone ! We would also like to thank the Guitar Factory Parramatta for their continued support. The Guitar Facory is the western suburbs’ longest continuously trading music store and located at 255 Church St. Parramatta NSW. Thank you for helping us make our dreams come true and to give the band this tremendous opportunity to show the world that Australia knows the blues. A long and overdue catch up with warm greetings to all! Things have been a little busy around the Mal Eastick camp so far this year, which commenced with Mal playing two memorable shows at the Thredbo Blues Festival in January. He also conducted a blues guitar clinic there which attracted over 125 people. The next couple of months saw Mal and his band, vocalist John Makey, bassist Ian Lees & drummer Rudy Miranda, play select shows to the north and south of Sydney. These are the guys who co-wrote and recorded with Mal on his gem album “Spirit”. In March, Mal was honoured to be one of four nationally-renowned guitarists selected to feature different styles both individually and together in a show called “Guitarama” at Sydney’s exclusive venue The Basement. In April, Mal spent some wonderful time with his young boys Aaron & Morgan as well as generally doing what musicians do. May saw Queensland’s inaugural Cairns Blues Festival which had Mal and his band take a quick trip to the far north for what turned out to be another one of those “You should have been there” shows. Needless to say Mal has been invited back to play at next year’s festival. After a couple of weeks off back home, a little more practice and more than a few coffees the boys were back to the airport on May 29 heading for another great festival, Blues On Broadbeach on Queensland’s Gold Coast. Mal played at this festival in ’06 and ’07 as special guest with his friend Kevin Borich, but this year was Mal’s first time playing the festival with his own band. Chosen to headline the Friday evening, Mal delivered a monumental performance to several thousand blues enthusiasts who battled the wet and windy conditions until the conclusion of one of his signature pieces, “Lenny”, a beautiful instrumental written by the late great Texan bluesman Stevie Ray Vaughan. After that track the band and their audience had to duck for cover fast as the rain took over the headliner position at a 45 degree angle. Saturday morning Mal flew back to Sydney to pack the bags and fly to WA the following day to do a show for each of the Perth, Albany & Bunbury Blues Clubs. Many thanks to all involved, all three clubs are so welcoming and hospitable and the gigs were sensational. Straight after the Bunbury gig Mal hit the road back to Perth airport for the 6am plane back to Sydney to play with his band that very night as one of the leading acts at the 2nd Gosford Blues Festival. The promoters were more than satisfied with the numbers, showing blues music is alive and well and possibly stronger than ever. The second week in June saw Mal head to northern NSW to play 3 all-instrumental shows as special guest with his mate Phil Emmanuel at clubs in Lismore, Grafton & Laurieton. Mal won much praise from those attending and his after-show CD sales were huge. On Sunday June 28 Mal and his band return to Beaches Hotel at Thirroul in the north of Wollongong, which is one of Mal’s favourite areas to play in on this continent. 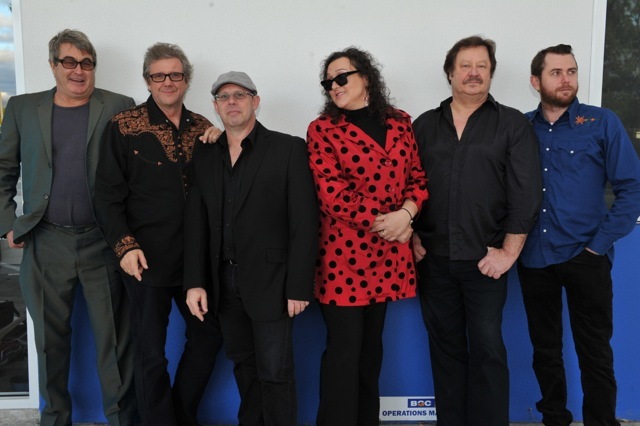 Coming up in October Mal is thrilled to be playing at Narooma Blues Festival on the Saturday evening. It has been many years since he played this legendary event. Mal just may have something special for this gig that will have the place jumping. Don’t miss the show. Mal and the band are set to play at the party of the South West Blues Club in Bunbury Western Australia, which goes to show that Mal’s recent gig there must have been a beauty. From all accounts those on the East Coast will read about this big party night soon after. Other dates appear on the Tour Dates section of the web site. Since Mal’s illness he has shown his commitment to this long and sometimes painful journey reinstating his mark in our music. Sincere thanks to you the dedicated music lover for your encouragement, support and faith in him over the years.